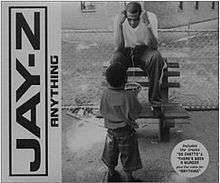 (2000) "Things That U Do"
"Anything" is a song by rapper Jay-Z that is found on Beanie Sigel's 2000 album The Truth. It is produced by Sam Sneed and P. Skam, who sample Lionel Bart's "I'll Do Anything" for the track's beat and chorus. The sample from Oliver! heavily popularized "Anything" as did the Annie sample on "Hard Knock Life (Ghetto Anthem)", "Anything" was also a bonus track on Jay-Z's album Vol. 3... Life and Times of S. Carter (UK/Europe edition) as is "Anything (Mr. Drunk Mix)" on the Japanese version of the album. Jay-Z admitted to Angie Martinez in a 2009 interview on the BET program Food for Thought that he hoped the song would be a success like "Hard Knock Life (Ghetto Anthem)" due to their similarities but was surprised when it wasn't, even saying "I dropped the record and then nothing". The song did, however, achieve moderate success in the UK reaching #18 on the singles chart. A music video for the song was also released, which was directed by Chris Robinson. Jay-Z later released another song named "Anything" that is found on his 2006 album Kingdom Come. This track features guest appearances from Usher and Pharrell Williams and is completely unrelated to the original "Anything". "Big Pimpin' (Radio Edit) (3:56)"
"Big Pimpin' (LP Version) (4:44)"
↑ "Swedishcharts.com – Jay-Z – Anything". Singles Top 100. Retrieved September 22, 2014. ↑ "Jay-Z: Artist Chart History" Official Charts Company. Retrieved September 22, 2014. ↑ "Vol. 3: The Life and Times of Shawn Carter – Jay-Z". Allmusic. Rovi Corporation. Retrieved September 22, 2014.